Click for CrossTown on YouTube!!! Tommy Lee's Methods of Mayhem recording experiment! Latest Recording Project - on Video! Dave Van Kleeck recording guitar tracks for Tommy Lee's "TALK ME OFF THE LEDGE"
And an inside look at part of the Studio and the equipment available for recording projects! Tommy Lee's METHODS OF MAYHEM Public Record Project - EVERYONE should get involved with THIS! Video of Dave recording the track is now up at CrossTownBand on YouTube! When and where were you born? : September 14th, 1955 in Compton, Los Angeles County, California. Grew up in Lynwood, Rubido and Alhambra before moving to Arizona at age 9. When and where was your first public performance? : San Francisco, California in June 1973, where I sat in with some bands on the military base on Treasure Island, where I was stationed until my discharge from the U.S. Navy in September of 1973. Then where did you first perform as a hired act at a civilian venue? : Alhambra, California in 1975. I played solo w/guitar accompaniment doing covers of Neil Diamond, Jim Croce, BB King and the usual mixture of Top 40 and standards as well as a couple original compositions of my own. What is your main instrument? : Rhythm Guitar, Vocals and Lead Guitar are my main instruments. I also play Bass Guitar, Drums and some Keyboards. Most of my writing comes from guitar against drums, or drum machine loops (which drives Bob NUTS!). I write a more rounded song from scratch when the beat, timing and rhythm structure are developing at the same time as the lyrics. How did you get your nickname? : Stevie Ray Trower is obviously the combination of Robin Trower and Stevie Ray.Vaughan? They are the two most influential singer/songwriter guitar players I've really taken the time to know musically. What have you accomplished so far in your career, or is this a hobby? : Honestly, this is more of a calling than a career. I have never been able to leave music behind, it's just in the blood, you know? I can't imagine life without it. As far as "accomplishments"<does the finger "quote" thing>, there are so many different answers to that question. I could say I survived the road and the pitfalls while some other people I know did not fare as well, if you can call that an accomplishment. I could say that I've learned and grown along the way, which is more of a byproduct of living than an accomplishment. Or maybe I could point to four previous original albums of material released in the late 70's. But, I think what I really want to answer is that it took music for me to find myself, my incredible wife and even brought me to the realization that there IS a God and I am NOT Him! That changed my whole perspective on life, on what's really important, and I have been being changed from the inside out ever since. That, I think, is what I want to say about "accomplishments". It's obvious from what I've heard from this CD that you have a religious or spiritual lyric style that lends itself well to the style of music you are playing: Well, that may be true, I do consider the lyrics to be spiritual in nature and I make certain as regards to the Spiritually focused songs that whatever is written is in agreement with The Bible. I tend to stay away from the idea of "religion" since there are way too many to keep track of. So, "religious" to me is a bit too generic and misleading. I write about many subjects, and I look at life from the spiritual perspective of believing in God, Jesus and The Holy Bible being the absolute Word of God. When I write about something it tends to automatically come from that point of view. It doesn't mean I hit people over the head with Scripture, I just see things in life in a different way now and so it effects the way I write about everything. Are you married? : Yes, to Callie, my soul mate and partner in rhyme for over 20 years now. Without her loving care and unconditional love for me, I quite probably wouldn't be here - literally! But that is yet another, and much longer, story. Any children? : Yes, two! And three grandchildren! Jason and Linda Marie are our children and have made us very proud, each in their own unique way. Linda Marie has given us three granddaughters and is hoping to be blessed with a grandson in the future. Jason Edward left this world far too soon and it is in his memory that Cross Town dedicates our Debut release "Point Of View". His dedication and the back story can be read HERE. What do you like most about your band? We have a different, yet familiar, sound to our songs. Coming from a heavily Blues and Classic Rock based influence, we continue to pay homage to those genres while giving as much thought and importance to the lyrical content of our songs. John and I have played together since the early to mid 70's, and Bob (Trogg) and I have played together since our High School days! Chris has played with John for 6 years or so and Chris has the same background in percussion and musical influences as Bob, which has made the transition extremely easy and enjoyable. With Bob on the road all the time, we were VERY lucky to get Chris to fill the void! We feel like family, best friends and comrades in arms. We all share the same passion for music and the same goal for our "career" in the Industry - to bring the message of the Cross, through contemporary music, everywhere we play. Tell me a little about your playing and why you chose the guitar as your main instrument? I chose guitar because all the music I liked growing up centered around that instrument. I felt it was the most expressive instrument I had ever heard. Passionate about God, life, love and music! Are there people you admire? My Mom for all her strength and kindness, my Dad for his convictions and wisdom, my step-Dad Milo for his ability to overcome life's obstacles and make his way HIS WAY, My brothers, Mark for his strength of character and wonderful ability to teach others, Breck for his incredible talents as an artist of ALL mediums, my daughter Linda Marie for having the courage to stand her ground on her own while having the guts to get to know me after all that time had passed, her husband Cameron for being a man of integrity, morals and courage, and of course our grand-daughters for giving me the chance to be a part of their lives! There are many others that have given of themselves to better the world around them, and most of all the Son of God for showing us the Way home and teaching us to bring as many with us as we can. Well, that about wraps it up for me, anything else you'd like to say? : Yes! Thank you for taking time out of your busy day to interview us and hopefully giving us a chance to create an interest in the music lovers out there to come and see us LIVE, where this all comes together in a high energy, passionate concert experience! Website © 2010 Alethea Records through PPCSI. CrossTown Band & www.crosstown-band.com. 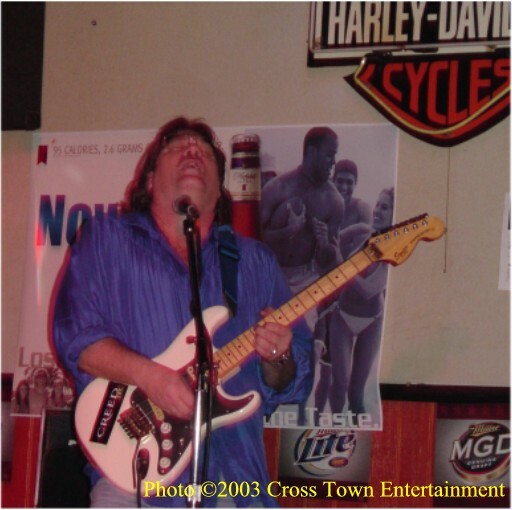 All purchase transactions on www.crosstown-band.com are conducted through our Secure PPCSI PayPal Transaction Servers. All content on this Website is copyrighted and controlled by PPCSI, Alethea Records, Jasoné Publishing, Chrysalis Music, LLC, Stardust Enterprises, Inc., V-12 Records, Robin Trower, Davey Pattison, and others. All Rights Reserved. Unauthorized duplication or redistribution by any means known now or in the future, without written consent from the Trademark or Copyright holder, is expressly prohibited.